The driveshafts are conventional Rotoflex, rather than the popular conversion to CV joints. Why? Well, Rotoflex is more original, but more to the point I had a pair of genuine Metalastik Rotoflex couplings, or rubber doughnuts as they are commonly called. I bought them in the early 1980s as spares, and they were in good condition having been stored in a box in a dark damp garage! They are far superior to the modern replacements and as no longer made in the UK are rare as hens teeth. In fact when I removed the old ones they were GM ones (which aren't supposed to be even as good as QH ones, but they lasted 30k miles), and they were breaking up. Another reason is sentimental, in the mid 1970s I used to work for Dunlop in their Polymer Engineering Division, in Leicester, who made Metalastik parts, and I remember seeing crates of these during manufacture. 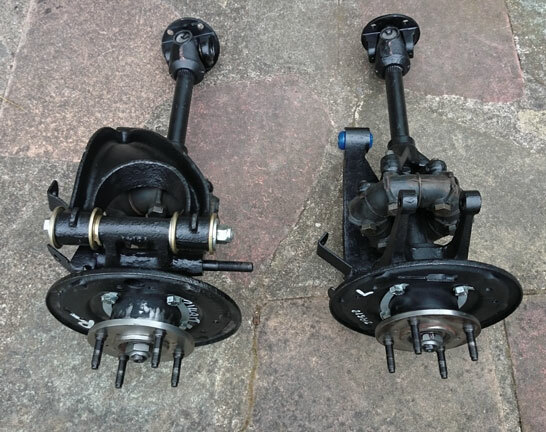 The rear Rotoflex suspension was totally rebuilt for me by Mike Papworth in. Some parts needed to be renewed as they were damaged, fortunately he had some good secondhand spares in stock - these were a rear hub and both vertical links (they were bent). 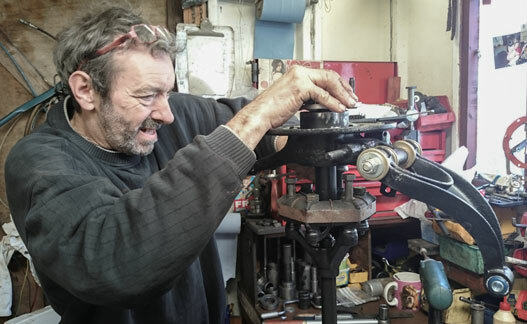 He can be seen below fitting the bolts to one of the Metalastik couplings in his workshop in Longford near Coventry. 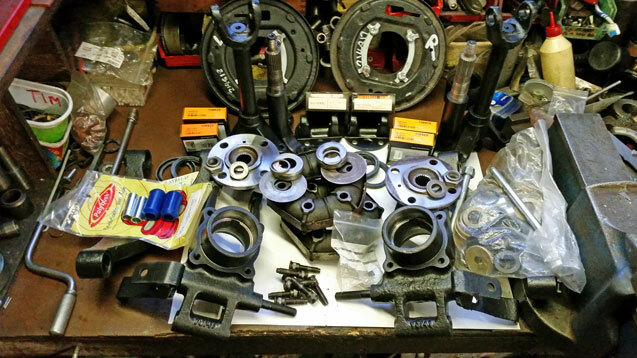 All the parts can be seen below, prior to re-assembly. The brake back plates (seen at the back) are refurbished ones from Canleys as the originals were heavily rusted. The fully assembled hub and suspension assembles can be seen above. Mike has fitted new Timkin bearings and re-shimmed to give the correct end float/preload using the correct Churchill tool. He is one of only a few people who can do this correctly. They are also polybushed (fitted with the correct polyurethane bushes). The combination of proper professional rebuilding and the fitment of NOS genuine Metalastik couplings should ensure long life. The rear radius arms can be see below, ready to fit. These go from the hub to a bracket on the rear of the body. The top one is NOS, although one of the threads had to be cleaned up with a die. The bottom one has been refurbished with a new threaded adjuster and locknuts, which are slightly larger than the original. They have also been polybushed. 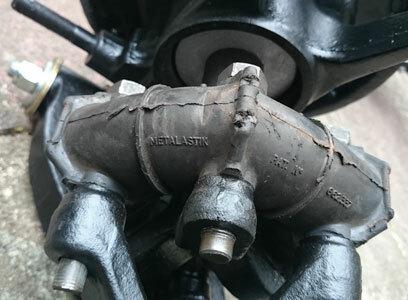 Note the Metalastik brand moulded into the rubber couplings (often called doughnuts) fitted to my car, above. These were originally made in Leicester by Dunlops Polymer Engineering Division but the brand now belongs to Trelleborg of Sweden. To read a leaflet about these click here (opens in a new tab). They were invented and first patented by Italian Antonio Boschi (1896-1988) who founded the first company to make them which he called Giubo spA, the name being a combination of Giunto (Italian for joint or coupling) and Boschi. Initially used on many industrial applications, they are known as Giubos on the continent where they were used on some BMWs and Porsches. In the UK where they are called Rotoflex they were used on the Triumph GT6 Mk2, Triumph 1300 FWD, Lotus Elan and early Land Rover Discoverys.